Contact centers face a growing array of media to handle increasingly diverse and complex customer interactions. Customers present high expectations for stellar service, and real-time response with rapid resolution and spot-on answers. At the same time, centers must find ways to squeeze more out of the workforce without risking burnout and turnover. It’s a tall order, but one that can be addressed effectively with today’s tools and process optimization. 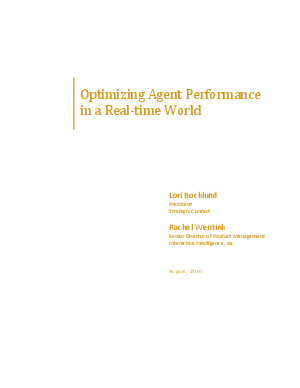 The tools and processes to optimize agent performance are multifaceted — addressing the desktop to handle the contact, and performance tools to measure and monitor. The desktop includes knowledge management (KM) and scripting, as well as agent assistance tools. A performance tools suite includes quality monitoring (QM), workforce management (WFM), customer feedback, and coaching tools. Another key ingredient is a strong feedback loop that uses those performance tools to drive actions that the individual and team can pursue for overall optimization. The following diagram presents the essential elements to performance optimization.